On June 7, 2007, a Delta II rocket launched from Vandenberg Air Force Base in California. Knowing full well this event was taking place, Air Force Staff Sergeant Eric Thompson, an instructor with the 532nd Training Squadron, figured he knew a place that might provide a better view than usual. 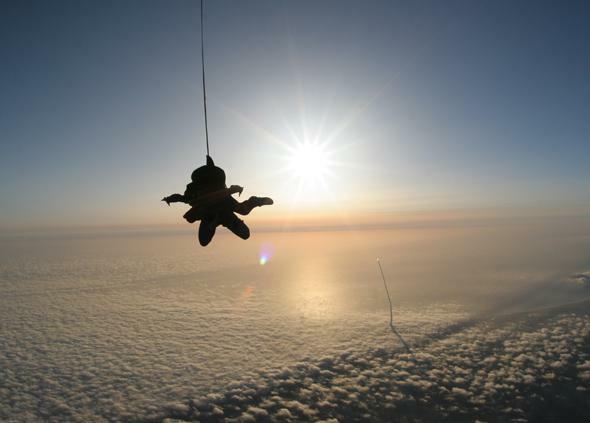 This amazing picture was taken just after 7:30 p.m. local time, as the Sun approached the horizon, the divers approached the ground, and the rocket blew through the clouds and approached the sky. The rocket carried an Italian Earth-observing satellite called COSMO-SkyMed. I saw a Delta II launch many years ago, standing on a Florida beach with my brother-in-law. It was pretty amazing; we stood there gaping as we watched it rise up and to the right, the strap-on boosters falling like fireworks after a few seconds, the main rocket continuing up and on into space. But now, I have to admit, some people really know how to watch a launch. Tip o’ the ripcord to NASA Goddard.